This week has seen the unveiling of the latest striking addition to the city centre mural trail. 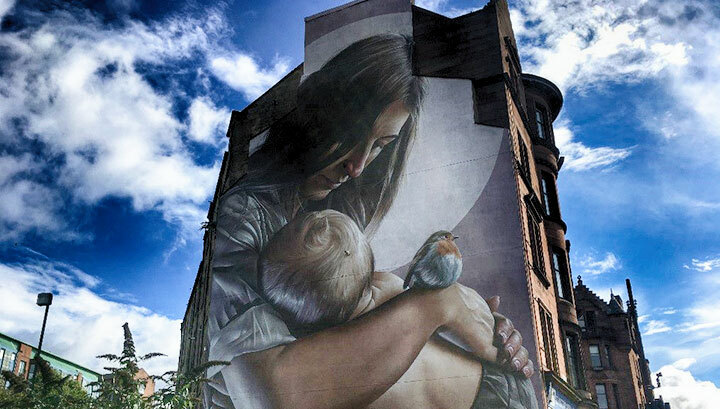 Artist Smug’s latest work can be found at the corner of George Street and High Street and depicts a mother and child already widely thought to be St Enoch and a young St Mungo – a companion to the much loved St Mungo mural on High Street. Smug’s other work can be found throughout the city centre on Ingram Street, Mitchell Street and Argyle Street. Glasgow’s mural trail continues to garner international interest even recently featuring on German news channel ADR TV during the European Championships – encouraging visitors (and residents) of Glasgow to come and explore the city and its eye-catching artwork.